This week's Maitri Tunes brings us the journey that a seeker undertakes: "That of losing oneself, to find Oneself." Here the love story of Sohni-Mahiwal is used as a metaphor to suggest that a seeker (Sohni) longs to cross the river of desires and reach the cave of the heart (Mahiwal). "Wondrous are the ways of love’s river, running in directions strange. He who enters it, drowns, O Khusrau, and he who drowns goes across." There’s a whirlpool inside. Questions swim up and sink back into the vortex. I must attempt to embrace them, and swim with them to the other shore where answers wait. But who is this songster and what is it he so intriguingly sings about? Is he a forlorn lover? Or a devotee “wanting a God outside and beyond himself to reach out to and worship, or the sage who wants to realise himself as the One Self reaching out to his idea?” Is he a dualist or a monist? Sometimes, he appears to be this, sometimes that, in this poem. Who is he indeed? A shape-shifter, he takes on this role, then another, and yet another. A silver-tongued bard who speaks for so many actors? Is he the clay pot that the wise liken to the body – fragile and easily broken? One with form and name destined to perish in the waters of samsara? Is he a charlatan pretending to be a teacher? Or is he the Lover that sits in the garb of Mahiwal across the river waiting for Sohni, the Beautiful One, in the hut? Is the hut not, in fact, the cave of the heart that the Upanishads speak of? In the secret cave of the heart, two are seated by life’s fountain. If it is, who goes across the river, to seek whom? Has the poet donned Sohni’s garment and must now swim across the deluge to the call of Love, knowing well she is not going to make it – not alive? Khusrau is right. He who enters this turbulent river must drown. Yet what is it that makes her willing and joyful in the face of the annihilation? How she follows Love as it beckons her! Is this the Love which Kahlil Gibran speaks of as one, the ways of whom are hard and steep? Sohni is bound to meet with her Mahiwal tonight, come what may. For her heart knows that "like sheaves of corn Love will gather her unto himself. He will thresh her to make her naked. He will sift her to free her from her husks. He will grind her to whiteness. He will knead her until she is pliant; and then He will assign her to His sacred fire, that she may become sacred bread for God’s sacred feast." Yes, her heart, it knows. And so she has thrown herself into the deathly river. Let the vessel of the body break if it must. But is she only the body, I wonder? Can the evanescent body alone leave in its wake such eternal beauty, such elevating poetry, painting, stories? And yet, is the temporal of no consequence? 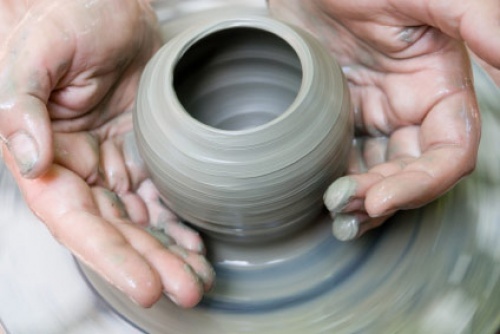 If clay were enough, why would the potter put it on the wheel and toil to shape it into a pot? Is this poet only another poet? His poem just another song of misfortune in the annals of the love? Isn’t he also the inner guide, the Master, murshid, the yogi who, as the fired clay pot, has been scorched in the fire of knowledge that makes possible union with Love? The sakhi (friend) who sweetly asks Radha to burn the bridges of envy, fame, pride and reputation in the fire of longing to unite with Krishna? Is he not the ‘sound guide’ that will help Sohni across the whirling pools of transience? But listen here. What of the river? Are there two shores or they only appear to be so? Sohni on the one shore, Mahiwal, on the other. Does the Chenab divide them, or is the division illusory? When both find immersion and absolution in it, all that is left is the river. Did not Tagore say only in love are unity and duality not in conflict! "He who drowns in this river is taken across to the shore, to the beyond"
If it is her corpse, so what?